Maxim’s Wine Bar, Tue 14 Feb. The debut of Matt Byrne’s newest work, My Kitchen Fools marks 20 years of Matt Byrne Media doing theatre at Maxim’s Wine Bar. No doubt the perfect accompanying drink can be found at the bar! My Kitchen Fools, is essentially theatre, but also contains elements of stand-up comedy, musical theatre, cabaret and even some choreography and dance along the way. It’s irreverent and funny, satire and parody, but there is also more than a little existential despair in the writing, keeping this down to earth. The four actors – Marc Clement, Niki Martin, Stefanie Rossi and Matt Byrne – play the judges and in pairs, the four teams (Bogan sisters, gay guys, Greek grandma and single grandson and a pair of hippies). However, this is also a reflection of the images and characters that are on our little screen as supposed ‘reality’ TV. Along the way just about every celebrity chef, cooking show and some other reality shows are also featured, such as Goggle-Box, which has several sessions to reflect on the main course (or entree or whatever is not actually being prepared) and the stand-up French Chefs are reminiscent of English comics doing ‘hello, hello’ jokes – except about flies and soup, as you would! This was the first night, there were a couple of times things got slightly off script – and the actors simply did exactly what the characters would and produced some impromptu lines that deserve to find a way into the script. There were times a small number of audience members found the double and triple entendre a little hard going, it was relentless, but along the way there was also some very clever twisting of the language. Costumes were simple, typically each character had a simply ‘signature’ such as sunnies or a scarf and just a simple turn or donning or doffing of said piece and the character change was complete. Everything on the set was out in the open, even the back-stage glimpses of what the celebrities get up to when nobody is watching. There were a couple of times the mics were a little low to hear the dialogue clearly, quickly corrected, but in general the preview night went off without a hitch and this show will grow and develop along the way as the audience interacts with the very fine actors on the stage. This preview night performance went for two-and-a-half hours. No doubt it will be slightly sharpened to bring it back to the advertised 120 minutes. All up, Matt Byrne has written, directed and played a great spoof. It’s saucy, bawdy and quite earthy in humour. He has assembled a brilliant cast, actors coming from starring roles in the Dunstan Playhouse to TV roles for the ABC. And the silent members of the cast – from sound and lighting to props and choreography have also done a brilliant job. My Kitchen Fools will have you laughing along the way, but there is a very intentional barb, asking the question that if this is entertainment (meaning the real unreality shows that are actually on television) where is our culture going? 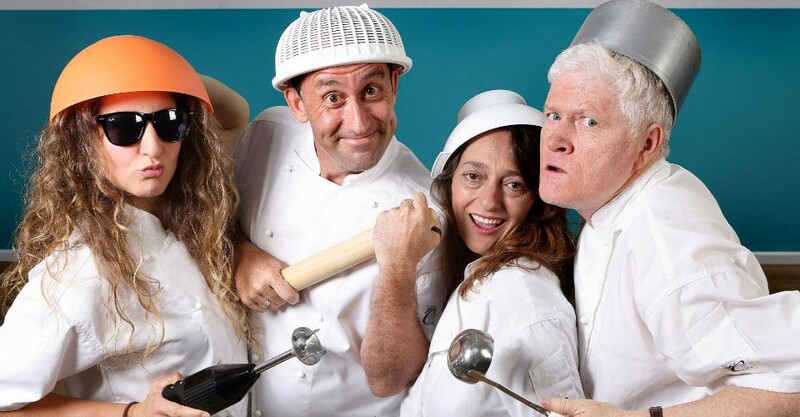 Matt Byrne’s My Kitchen Fools continues at Maxim’s Wine Bar from 7.30pm until Sun 19 Mar. Saucy, bawdy main course served up by a brilliant cast!